Samir Doughty posted his best stat line of the season in tonight’s win: 23 points, 9 assists, 7 rebounds and 3 steals. Samir Doughty scored a career-high 23 points in VCU’s second consecutive A-10 road win, this time taking down Duquesne 94-87. The Rams got in foul trouble early, picking up 16 first half fouls before heading into the lockers with a 37-33 lead. Duquesne would erase that lead by taking a 44-42 advantae with just over 16 minutes to play, a lead VCU would quickly regain and stretch to as many as 18 points with 1:27 to go. Duquesne used a late spurt against VCU’s bench to make the game appear closer than it ended up being. Doughty’s big night paced the Rams on a season-best team scoring performance. 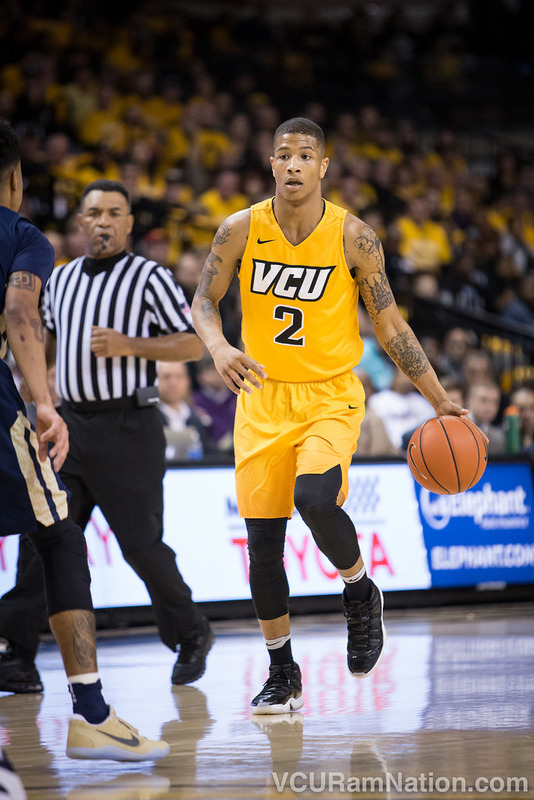 He was one of five Rams to post double-digit scoring in a game VCU would shoot 56.9% from the field. Not only did the redshirt freshman from Philadelphia fill up the scoring column but posted a balanced night of stats as well. Doughty added nine assists and three steals, both game-highs, as well as seven rebounds for the Rams. He was 9-15 from the field. Mo Alie-Cox added 18 points for VCU, just out-pacing Justin Tillman’s 16 who matched Doughty’s seven-rebound performance. Johnny Williams added 13 points and four assists with fellow point guard JeQuan Lewis scoring 11 to go with his seven assists. The Rams out-rebounded Duquesne 38-31 but once again lost the turnover battle, turning the ball over 16 times do Duquesne’s 15. The win moves the Rams to 12-3 on the season and a perfect 2-0 in Atlantic 10 play. VCU will return to Richmond to take on UMass (11-4, 1-1) in the Rams’ A-10 home-opener.